Starting under $100 per night, these budget-friendly cabins keep more cash in your pocket for fun attractions, Smoky Mountain souvenirs, and downtown restaurants! Located in Gatlinburg and Pigeon Forge, these budget-friendly cabins don't skimp on amenities. You'll still have perks like fully equipped kitchens, hot tubs, Wi-Fi, big screen TVs, game tables, mountain views, and more! Browse below or let one of our Vacation Planners find the perfect money-saving fit for YOU! Call 1.800.684.7865! 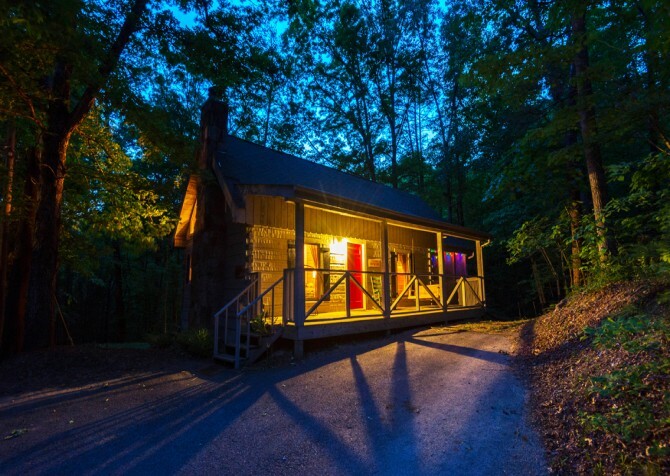 Welcome to A Blissful Bear — your budget-friendly, 2-bedroom cabin for 6 nestled in Gatlinburg, TN! 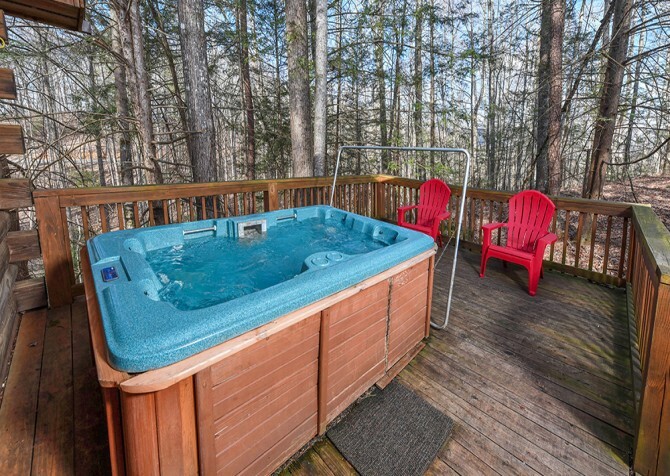 Offering more than just a place to stay, this affordable cabin rental features a bubbly hot tub outdoors, a fun pool table, big screen TV, fully equipped kitchen, 2 king-size beds, and a convenient location to the Great Smoky Arts & Crafts Community. 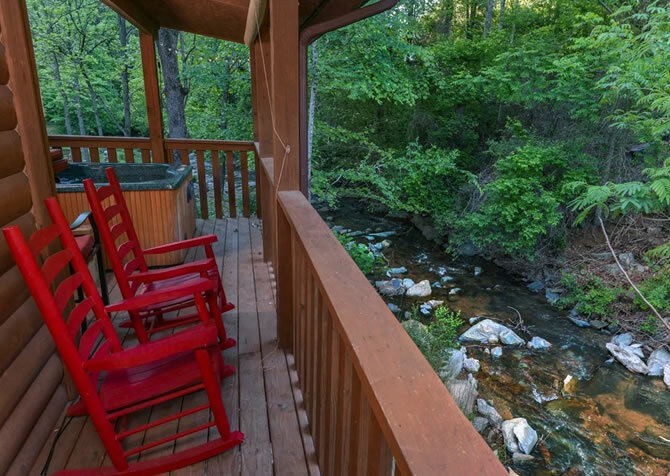 Fall asleep to the sounds of a slowly winding creek only footsteps away from the porch of this 1-bedroom cabin. 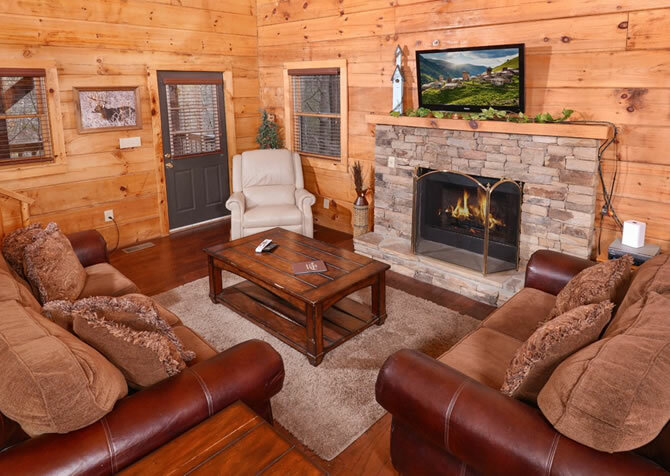 Located in Gatlinburg, this pet-friendly cabin offers a log interior and covered porches to enjoy the outdoors no matter the weather. Soothe your aches in the hot tub or get dressed up for a night out in nearby downtown, where you'll find restaurants, shops, and plenty of attractions. 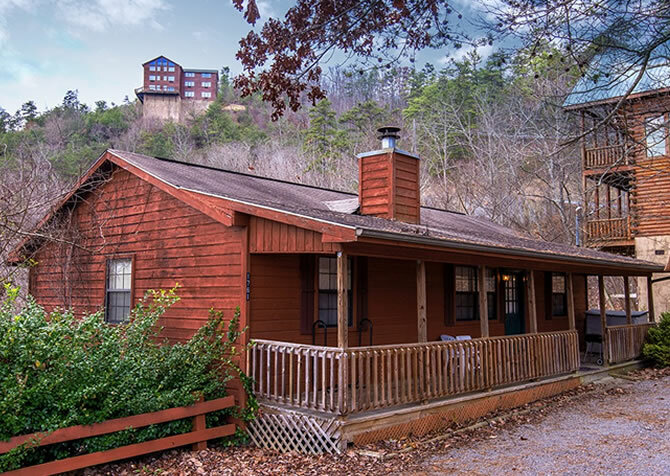 Deep in the mountains of Pigeon Forge sits this 1-bedroom cabin, located nearly an equal distance from both Pigeon Forge and Gatlinburg. Warmly decorated, this cabin boasts a roomy kitchen with French doors that open into the rec area with a pool table. The master bedroom offers a king-size log canopy bed and jetted tub that will start each day off on the right foot. 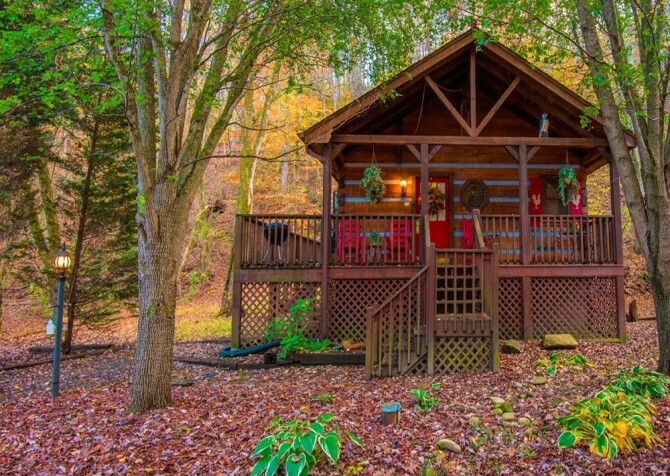 With room for just 2, this 1-bedroom, 1-bathroom Gatlinburg cabin features the conveniences of home and lots of amenities for a great honeymoon or romantic getaway. Take advantage of the washer and dryer, charcoal grill, or gas fireplace. Then relax and stay entertained with a big screen TV, community pool access, an indoor jetted tub, and peaceful wooded views while you unwind here. Make your next trip special by staying in A Perfect Paradise, a 1-bedroom, 1-bathroom cabin in the Smokies — featuring a king-size bed, a wood-burning fireplace with beautiful stonework, a fully equipped kitchen ready to serve, and an outdoor hot tub with a mountain view! From restful sleep and cozy nights to homemade meals and relaxing times, pure enjoyment is an understatement. In the Beside the Still Waters community, this charming and cozy 1-bedroom cabin is perfect for romantic weekends and can accommodate a couple extra guests. Spend days soaking in the hot tub on the wraparound deck, enjoying wooded views from the table outside, or curling up in front of the big screen TV in the living room. It also has a fully equipped kitchen and table for 2 for romantic meals! 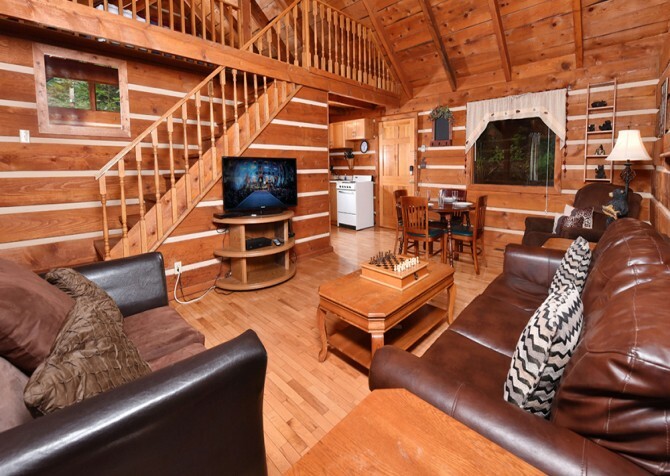 This charming cabin rental sits only 4 miles from the downtown area of Pigeon Forge, keeping you close to the restaurants, shops, and attractions of the area. Two bedrooms and sleeping 6 guests, this cabin is located along a small creek and boasts a stone exterior that hints to its name. Play the board games, relax in the hot tub, play foosball, or sit on the porch swing and just enjoy the refreshing mountain air. 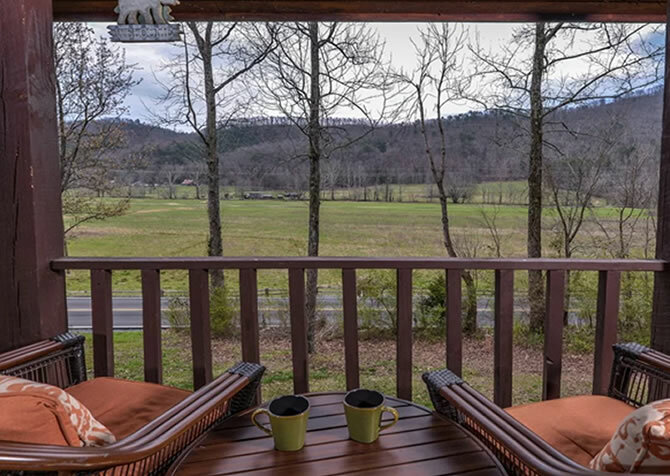 Located just a short drive from downtown Pigeon Forge, Paradise Point is a cozy 2-bedroom cabin that's great for couples, a few friends, or a small family. High-speed internet, a TV in the bedroom, an outdoor hot tub, and a relaxing gas fireplace will spoil you on your Smoky Mountain Vacation. Enjoy the lovely mountain views from the deck or have a romantic night in the plush king-size log canopy bed or the queen-size bed. Secluded and set away from it all, this cabin boasts a majestic mountain view and no steps to enter the cabin. 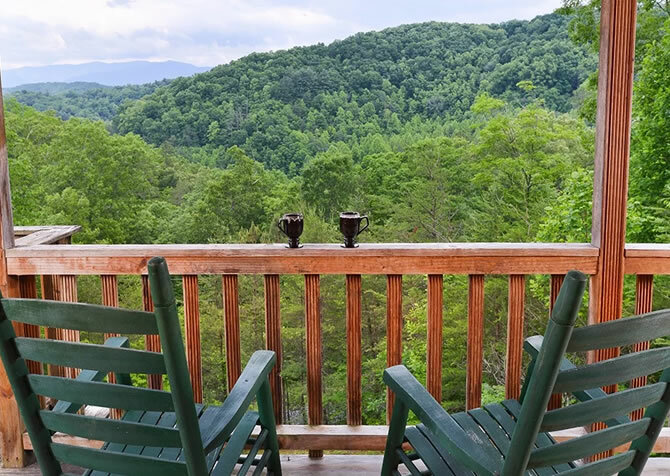 Sit back on your covered porch and gaze at the mountain peaks of the Great Smoky Mountains from the rocking chairs or porch swing. Internet access and a flat driveway are convenient, and a hot tub offer you ways to pass the time, whether relaxing or having fun. 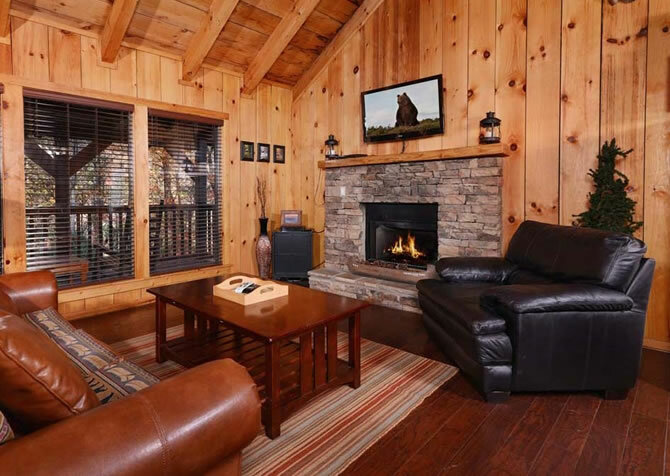 A gorgeous and luxurious studio-style cabin near downtown Gatlinburg, Seclusion is romantic and cozy. Its high-end amenities and stylish furnishings create a relaxing atmosphere, while its location near downtown makes it convenient to area restaurants and attractions. Unwind in the outdoor hot tub, sleep in comfort in the beautiful queen-size canopy bed, and enjoy peaceful meals in the lovely dining area. Cozy up in a queen-size bed, curl up in front of the fireplace and big screen TV in the living room, relax in the hot tub on the peaceful deck, or sit down for laid-back lunches at your own picnic table at Goodness and Mercy in the Beside the Still Waters community. It’s intimate enough for a couple and offers enough amenities for 4, including a full kitchen, wireless internet, and a Blu-ray player. Boasting a lovely mountain view, 2 master suites, Keurig coffeemaker, Google Chromecast, a private picnic area, and a covered back deck with rocking chairs, this cabin in the Smokies has awesome amenities and an affordable price, leaving you extra dough to bring home loads of souvenirs! 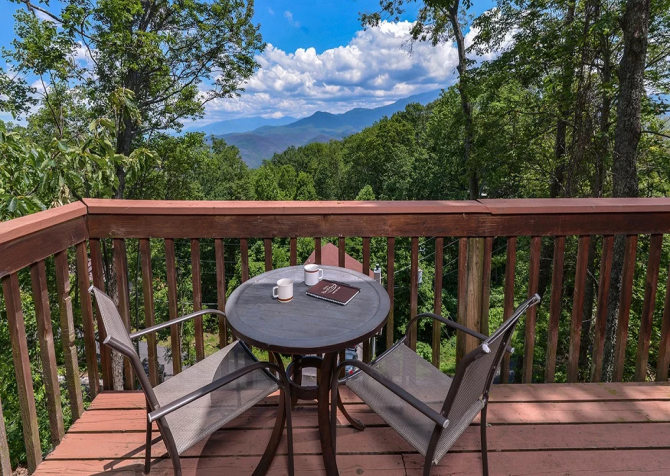 Nearby hiking trails, a hot tub on the covered deck, a picnic table by the water, a community fire pit, an inviting fireplace in the living room, dining table inside and outside…this studio-style cabin is just the place to rejuvenate and reconnect in the Smoky Mountains. It offers the conveniences of home and lots of great vacation perks for a memorable stay. A cozy, secluded cabin with a wood-burning fireplace, Irresistible offers 1 bedroom and is pet friendly. The beautiful outdoor spaces include a cozy sitting area, a porch swing, and a covered hot tub. 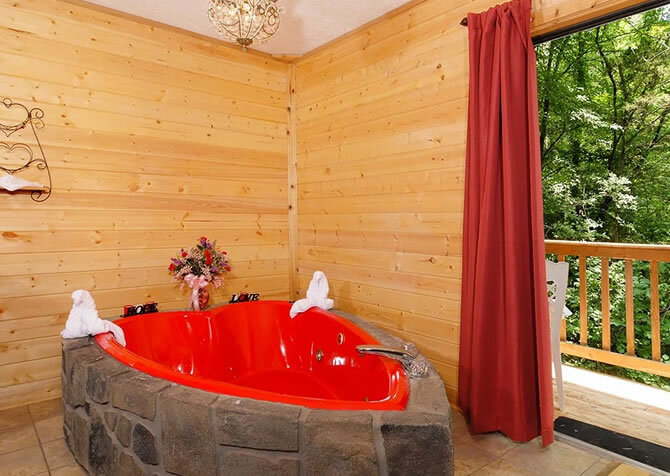 The indoor jetted tub has wooded views, and the bedroom has a comfortable king-size bed. Guests can play a game of pool, watch the flatscreen TV, or use the washer/dryer and iron and ironing board. 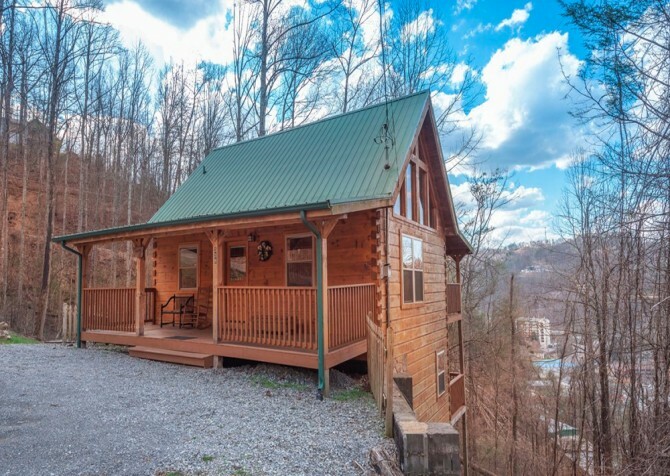 Located in Sky Harbor, this charming 1-bedroom cabin is just a short drive from downtown Gatlinburg. 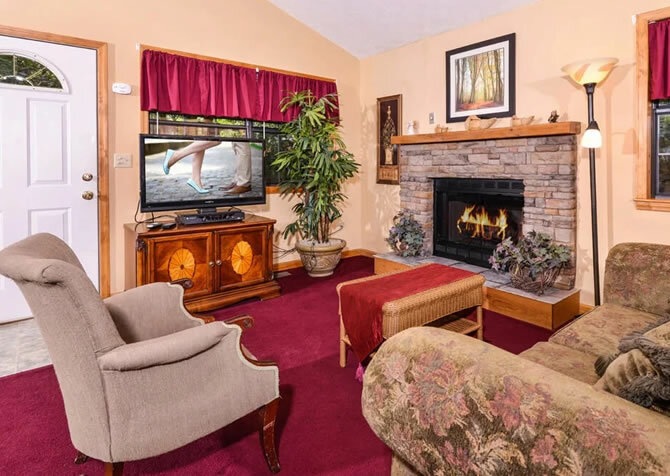 Check out area attractions or stay inside and watch TV on the 37-inch flatscreen TV, browse the web via the high-speed wireless internet, curl up by the gas fireplace on cool mountain nights, or soak in the hot tub at the end of the day. Whether your relationship has just begun or you’re celebrating decades, Angel’s Lair is a great cabin to carve out some time for a romantic retreat. 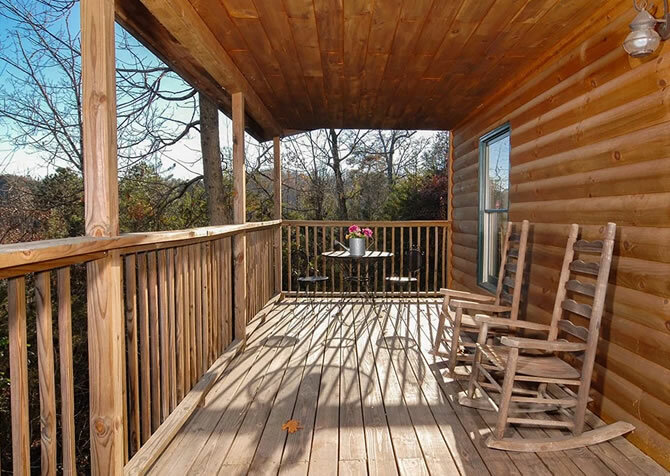 This Pigeon Forge cabin, tucked within the Smoky Mountain trees, features an indoor jetted tub, king-size bed, and a rocking chair porch where you can enjoy the view. Or head into town to explore the attractions! 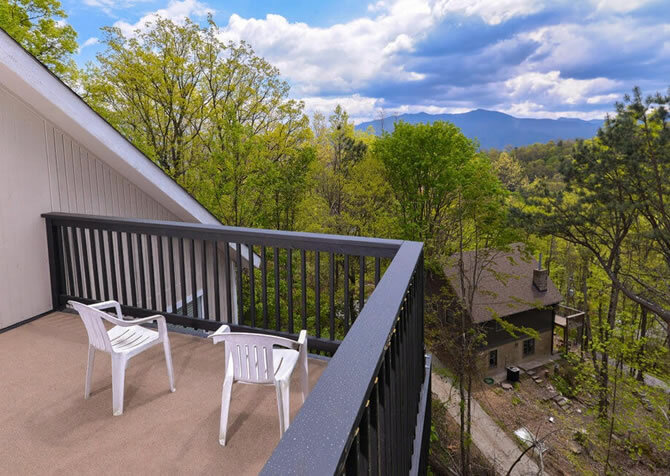 Get rejuvenated with a quiet escape to this charming 1-bedroom + loft Gatlinburg cabin for an anniversary or fun family getaway. 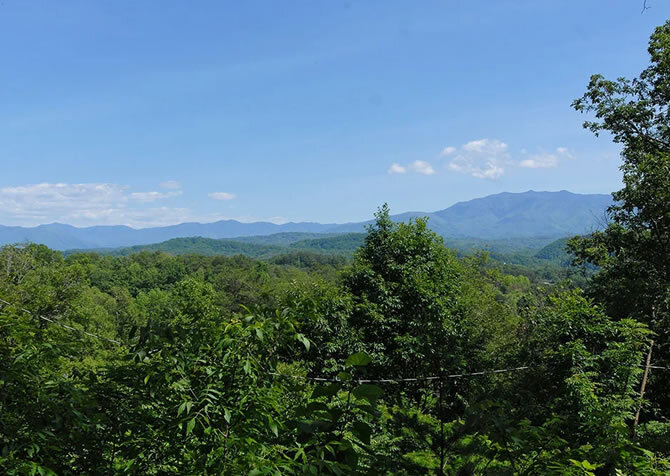 Only 1 mile from downtown Gatlinburg, it’s close to the fun without sacrificing the peaceful mountain atmosphere. 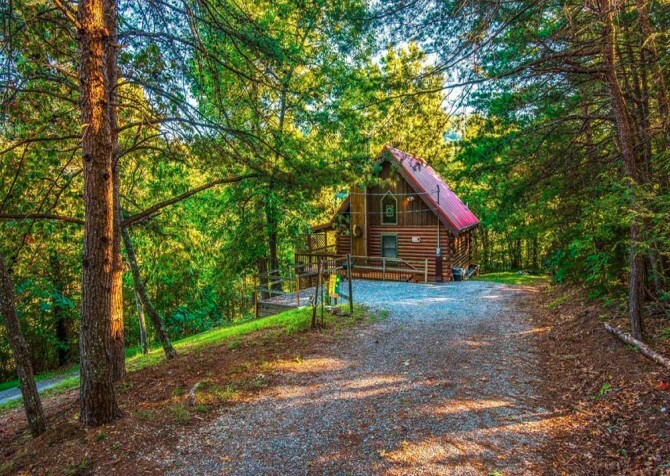 A budget-friendly and quaint escape, this Pigeon Forge cabin features 1 bedroom and 1 bathroom with room for 5 guests. A wooded view from the hot tub and windows add to the natural serenity of this log home. Have a seat on the leather furniture and flip on the TV for a cozy movie night with buttery popcorn from the fully equipped kitchen. Then head to the queen-size bed or loft for a snooze. 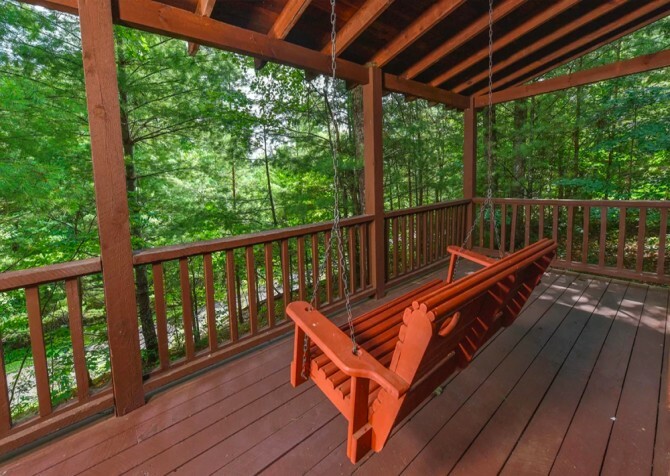 Less than 3miles from the downtown Parkway, this Gatlinburg cabin rental is a great escape for a couple's getaway. 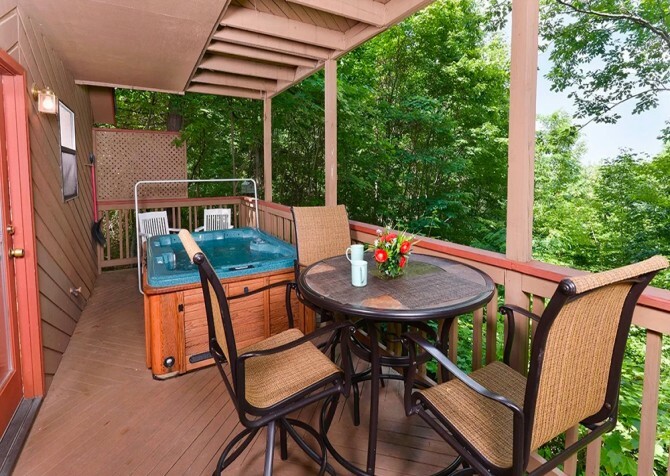 Two open decks allow you to gaze at the Smoky Mountain stars from the hot tub or patio furniture. Enjoy the great outdoors and take advantage of this cabin's pool and tennis court access. Additional amenities include an indoor sauna, pool table, and more. 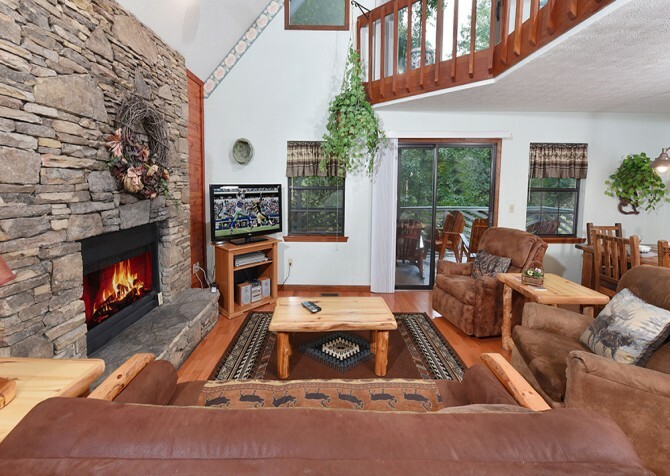 Perfect for a romantic retreat or family getaway, A Mountain Surprise sleeps 4 and features an outdoor hot tub on the screened-in porch, a covered deck with rocking chairs and a porch swing, 2 flatscreen TVs, and a jetted tub in the en-suite bathroom. 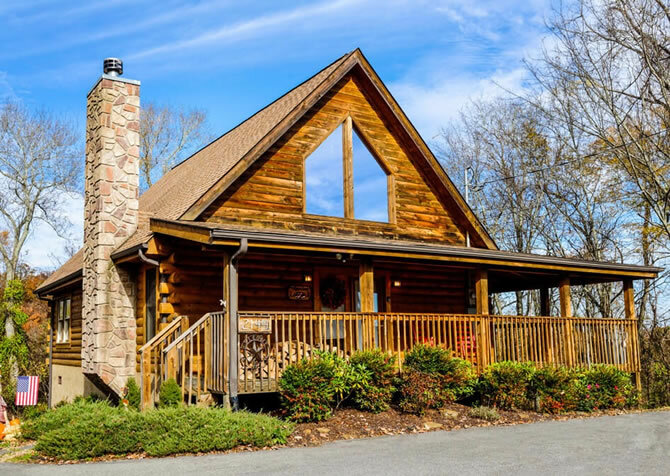 Enjoy cozy soaks with a mountain breeze, movie night by a toasty fire, and bubble baths every evening at this 1-bedroom, 1-bathroom home in Pigeon Forge! 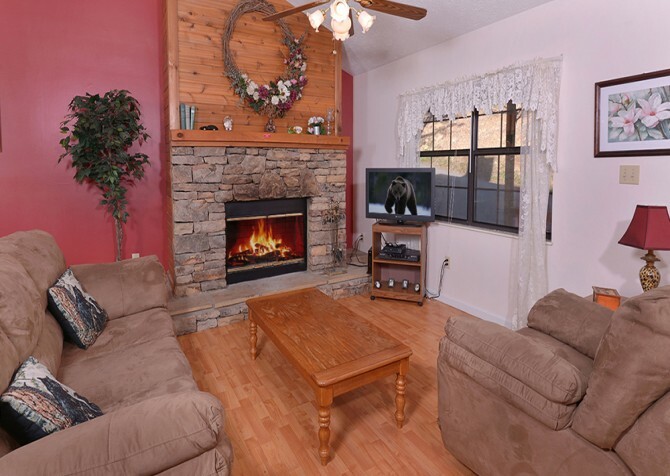 Semi-private, this Gatlinburg cabin is situated in the Chalet Village only 2 miles from downtown attractions. Featuring bright and welcoming interiors, guests enjoy conveniences like the wireless internet and cozy amenities like the wood-burning fireplace in this cabin. Play a round on the pool table or sit in the sauna at the end of your busy day. Whether you're getting away with friends or family, The Looney Bin offers a relaxing and comfortable escape. All the cabin conveniences, like a fully equipped kitchen and free Wi-Fi, will make you feel right at home. 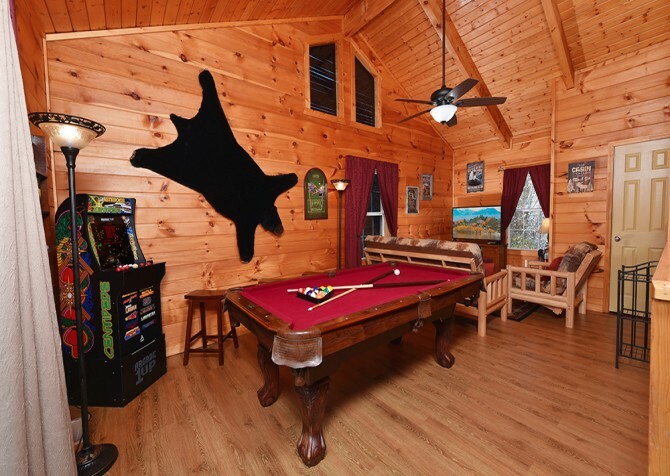 And the bonus amenities, like a flatscreen TV and bubbly hot tub, will leave you feeling entertained and pampered at this 2-bedroom cabin for 8 in Pigeon Forge. 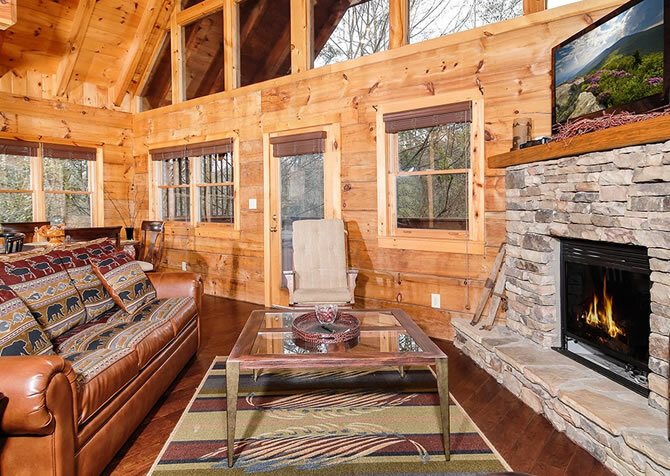 Cozily furnished and tucked away from it all, this Pigeon Forge cabin features something for everyone. Spend your time lounging on the screened-in porch which offers a hot tub, outdoor furniture, and large gas grill. A wood-burning fireplace and comfortable living area make for an inviting space on cool mountain nights. Take advantage of the washer and dryer on longer stays. Reignite the adventurous side of your relationship and take horseback rides through the mountains, kayak the nearby Pigeon River, and zipline through the forests, all before returning to Romantic Retreat for a dreamy dinner for 2 and long nights in the outdoor hot tub. With hundreds of attractions like Dollywood and The Island so close, it is the perfect balance of alone time and exciting excursions! No matter the occasion, you’re sure to enjoy a memorable stay at Bear Hugs, a 1-bedroom, 2-bathroom cabin for up to 4 guests in the Smokies. 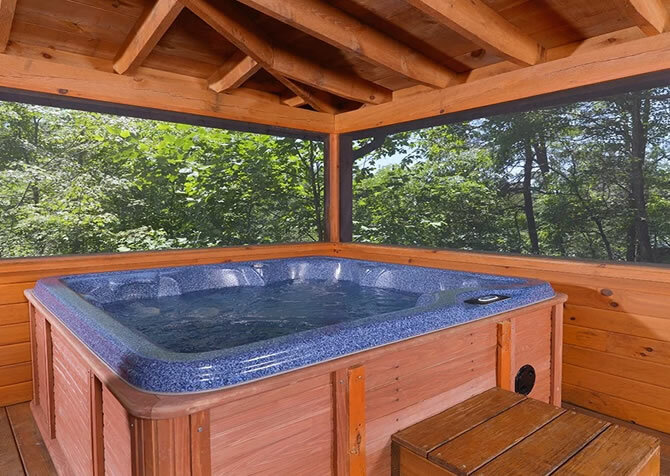 This semi-private abode resides in Gatlinburg, Tennessee, and boasts an outdoor hot tub, views of nature, a king-size bed, multiple flatscreen TVs, a pool table, and community pool access through Chalet Village Resort. 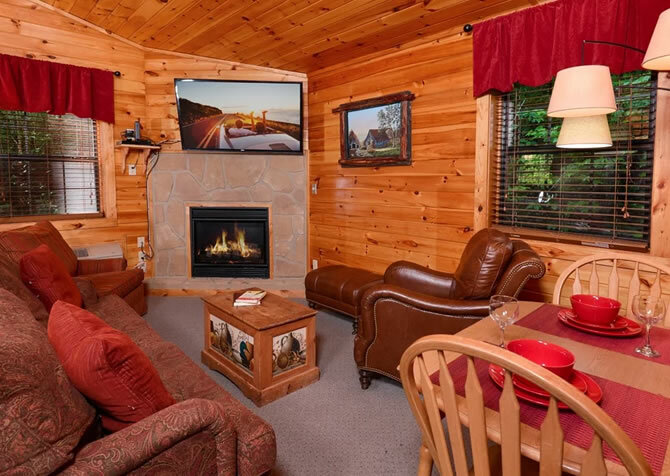 Just the right size for a couple, this 1-bedroom cabin features a cozy living room with a big screen TV and wood-burning fireplace, a relaxing indoor jetted tub, and a hot tub on a private screened-in deck for relaxing nights at the cabin. 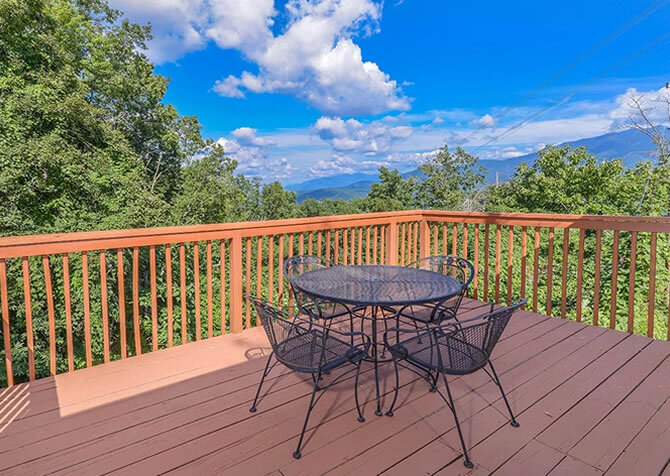 Take a short drive to downtown Pigeon Forge or stay around the cabin to enjoy the views or have a cookout on the grill in this budget-friendly space. 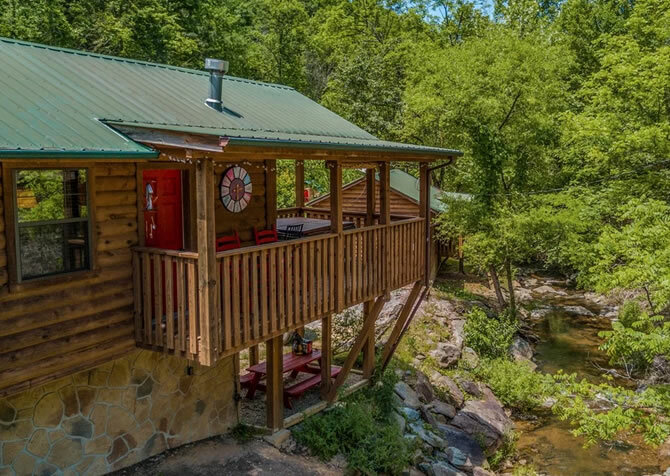 Situated quietly in the Eagle Springs Resort, this 2-bedroom Pigeon Forge cabin boasts pool access for summer fun and a private outdoor hot tub for relaxing nights. The bedrooms here offer their own private bathrooms and TVs for you convenience. Enjoy a drink in the rocking chairs or enjoy meals at the cabin with the gas grill and full kitchen. 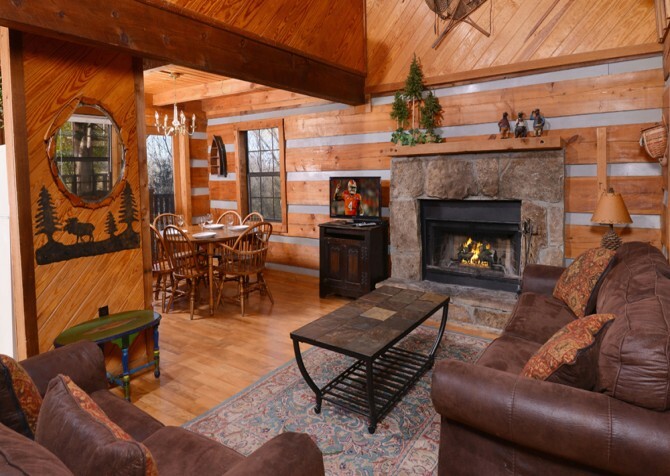 A delightful choice for a small family vacation, this 1-bedroom Pigeon Forge cabin accommodates 4 guests. 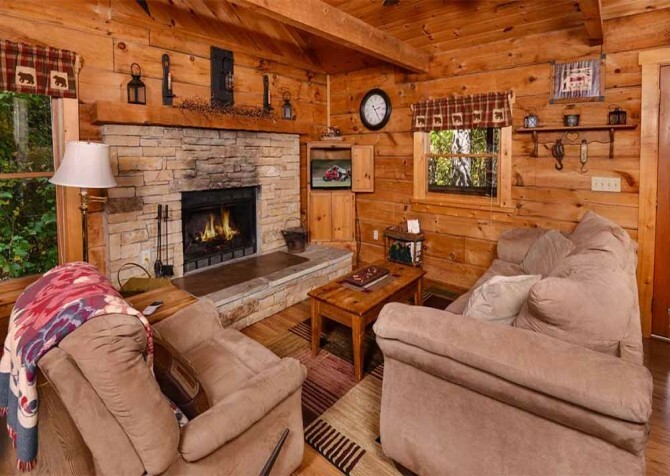 Beautifully decorated and inviting, this cabin features a stone gas fireplace and flatscreen TV to enjoy. 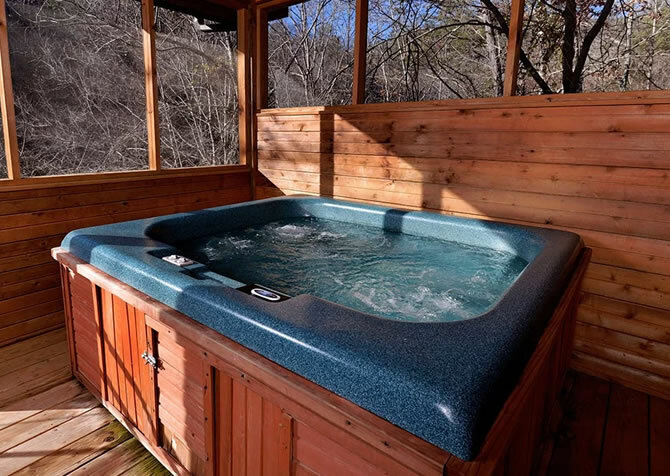 Enjoy the internet access and a soak in the outdoor hot tub during your stay in the Smokies - walking distance to American Charm and American Dream. Bring your sweetie or small family to the Smokies for a memorable Pigeon Forge getaway at Shades of the Past. This 1-bedroom, 1-bath cabin for 4 features an indoor jetted tub, a screened-in outdoor hot tub, a queen-size bed, and valley views. 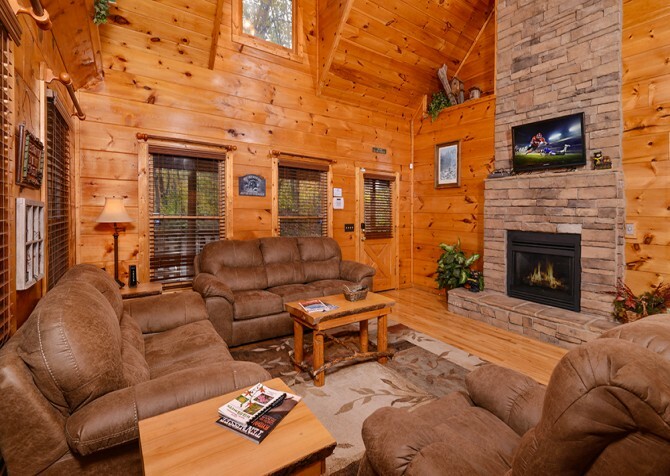 Enjoy all the relaxing amenities this cabin affords with less than a 4-mile drive to downtown fun, food, and shopping! A 2-bedroom pet-friendly cabin that feels like home, Lorin Aleah has room to sleep up to 6 guests. The semi-private location offers tranquility, and amenities include a hot tub, gas fireplace, charcoal grill, satellite TV, DVD player, and full kitchen. With a location near downtown Pigeon Forge, Lorin Aleah is convenient to the Tanger Outlets, area attractions, and local restaurants. When you and your fellow visitors are not exploring the cities of nearby Pigeon Forge and Gatlinburg, take long, relaxing dips in the hot tub, play pool while your favorite sporting event airs on the HD TV in the living room, or rock slowly on the back porch while the sounds of wildlife chirping and humming in the afternoon light drifting through the surrounding woods. 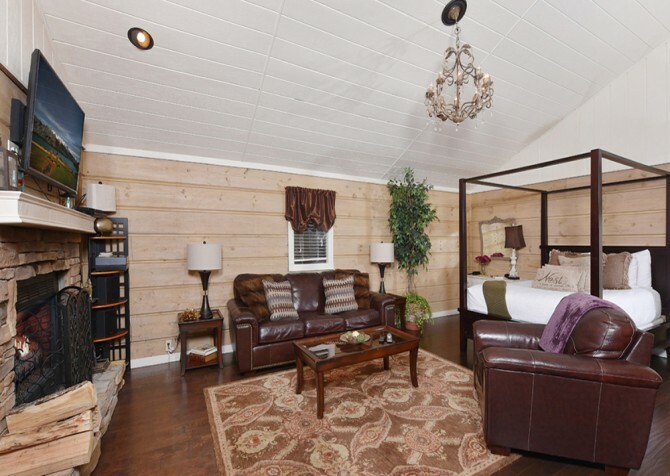 Great for a romantic retreat or small family getaway, Precious Moments is a private, 1-bedroom, studio-style cabin for up to 4 guests in Gatlinburg, TN. 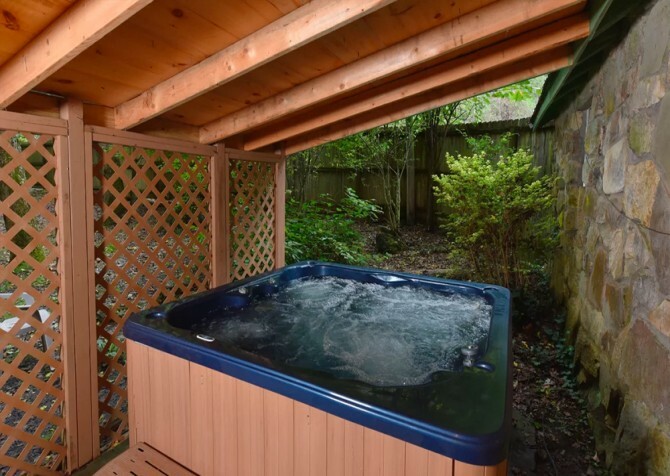 Soak in the outdoor hot tub, watch DVDs on the flatscreen TV, sip cocoa by the cozy gas fireplace, enjoy spa baths in the indoor jetted tub, and head to dreamland in the king-size bed. Small groups and families will find just the right size cabin at Mountain Getaway, located only about 5 miles from downtown Pigeon Forge. This 2-bedroom, 2-bath cabin can sleep up to 6 guests. Bring your family—furry friends included—for a Pigeon Forge vacation that’s relaxing, comfortable, and fun! 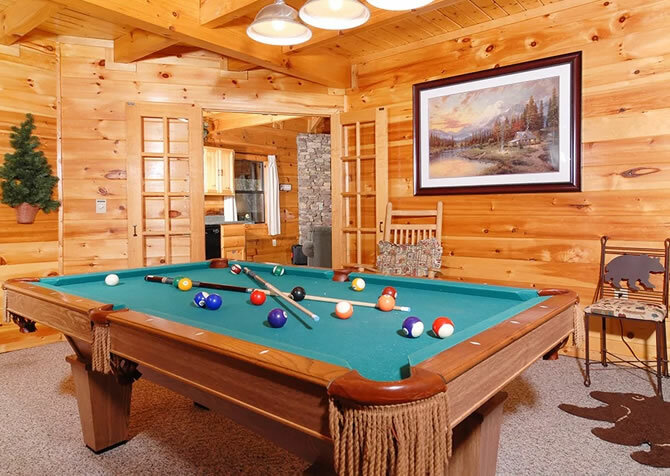 Play pool, air hockey, foosball, and arcade games in the cabin, too! My Cup Overflows, in the Beside the Still Waters, is cozy and filled with amenities, perfect for honeymoons, small family getaways, or a peaceful weekend with a couple friends. It boasts a big screen TV and Blu-ray player, wireless internet for staying connected, a soothing hot tub, a peaceful waterfront location, and more! Looking for a fun-filled getaway or relaxing escape for up to 6 guests? Bonnie and Clyde in Chalet Village Resort has you covered — with 2 bedrooms, 2 bathrooms, a fully equipped kitchen, an outdoor hot tub, community pool access, lush wooded views, rocking chairs, a flatscreen TV in every bedroom, a PlayStation 2 console, an indoor jetted tub, and king-size beds. 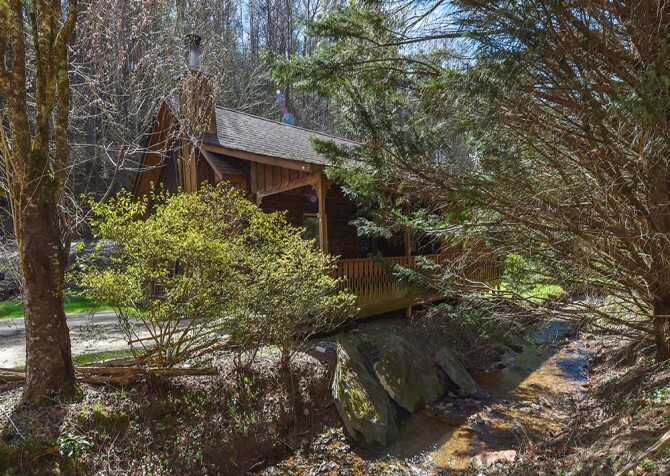 Semi-private and peaceful, this charming cabin offers a great location nestled between the towns of Gatlinburg and Pigeon Forge, Tennessee. Board games offer you ways to pass the hours, while the hot tub and gas fireplace will melt all your stresses away. Guests enjoy the washer and dryer and full kitchen when embarking on a long vacation to the Smokies. 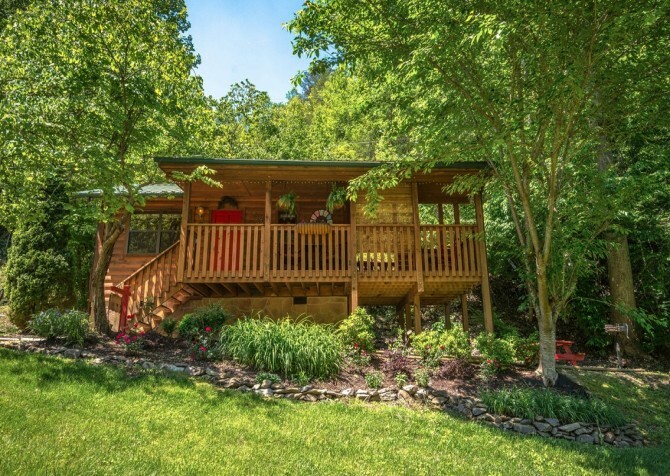 This charming Pigeon Forge cabin offers a flat parking area and only a few steps to the front door, making unpacking and getting your vacation started easy. Be greeted by a welcoming log interior throughout the home, a wood fireplace, and roomy covered deck. Pass the time by playing board games, cooking in the full kitchen, or swinging on the porch swing as you soak in your valley view. 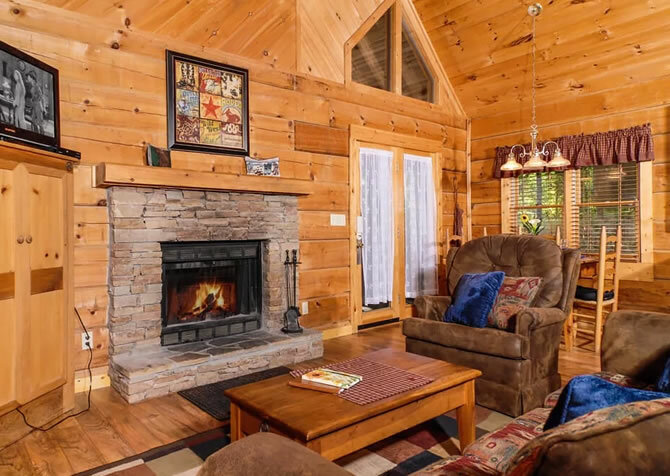 Peaceful serenity awaits tucked away into the Smoky Mountain forestry in this warm, welcoming cabin that’s pet friendly, romantic enough for a couple, and spacious enough for a small family getaway.